30% of children diagnosed with a rare disease die before their 5th birthday. Their families feel isolated and often their loved ones simply do not know what to do or say to support them. This project was designed to start the conversation about child bereavement due to rare disease and highlight the need for more support for families. 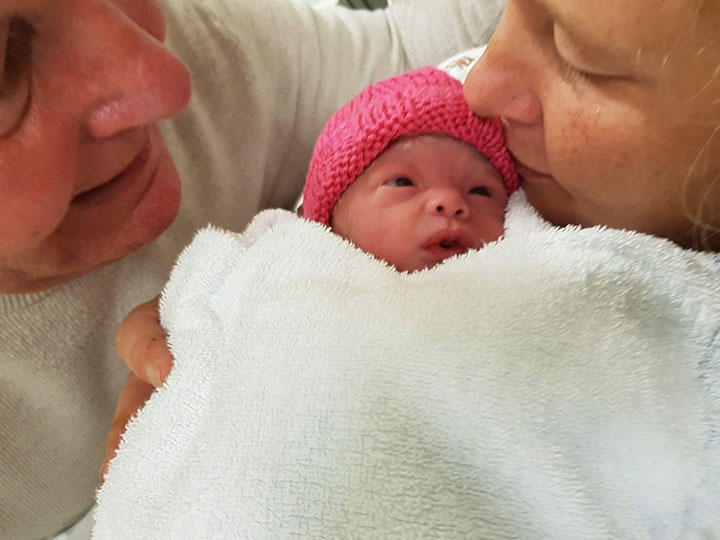 Karon and Pete recently took the time to tell us about their daughter Katie-Ann. “Katie-Ann had such a personality. She used to wear oxygen tubes and yet you could still see her pulling lots of different facial expressions. It was impossible not to laugh at her, it was unbelievable. I knew from the 20 week scan that she had a hole in her heart. We were referred for more tests and it was discussed that she might also have issues with her brain. It wasn’t until late pregnancy, they referred me to the Birmingham Women’s hospital and then they did mention a number of different scenarios and Edwards’ Syndrome was on that list. By the time we had our last scan they said they were nearly 100% sure it was Edwards’ Syndrome. It was really hard all the way through the pregnancy and we never knew from one appointment to the next what they would say. I was quite ill as well as I suffered from pneumonia and a blood clot on the lung. All I wanted was to protect the baby. I didn’t know what to expect because we were just not getting any information. They initially said they would refer her to a heart specialist regarding the hole in her heart but they gave us very little other details. From the moment we were told there was a problem we were given no information or support. The only information we found out was through our own internet searches. We felt completely alone. We struggled as a family and it was heart-breaking having to explain to my other two children that there was a possibility she could pass away, we didn’t know how long she was going to live. We were told that when she was born she could go to the hospice but to us it was really important that she could come home. I wanted her home, I wanted just to spend quality time with her, as a family, and to try and do normal stuff while she was here. Even though they knew I had had a difficult pregnancy and she would have issues, I was very much left alone during the birth. I was induced and they had said there would be all sorts of specialists there but it was actually just a student midwife coming in to check on me and that was all. When she was born, I couldn’t look at her at first because I just didn’t know what to expect. I just looked at that clock waiting for the cry, that first cry, and it was a relief when I heard that. My heart melted then. I was able to hold her for a few minutes and then she was taken away and put into an incubator on oxygen. When I went to see her in neonatal she looked nothing like the baby I had initially held because of all the oxygen tubes. I just wanted to hold her but all I could do was look at her. We had no idea if she definitely had Edwards’ Syndrome and my head was just everywhere because I didn’t know what I was actually looking for to confirm it, it was so hard. After she was born they did not explain anything at all to us. I was listening to the doctors mumbling between themselves, mentioning the rocker-bottom feet which I hadn’t got a clue what that was but nobody spoke to us directly. We were just in a big wide world with no explanation, nothing, we didn’t know anything. 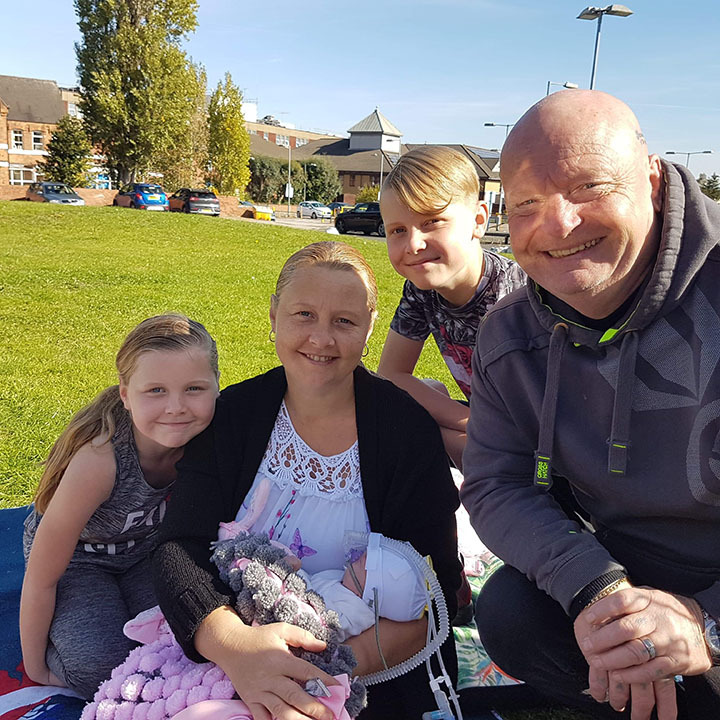 “When she was at home we had the community nurses coming out to check on her but they didn’t know anything about Edwards’ Syndrome either. We had absolutely no idea what to look out for or how the end would come. They just kept saying, you just know by the colour, with the change of colour in her. She wasn’t on oxygen or anything. She was out of hospital for two days and she started turning blue and we were really scared, we didn’t know what was happening at all. We phoned the ambulance, they rushed her straight in and confirmed she had a chest infection and were keeping her in hospital overnight. Two days later she was still in hospital because we had to wait for all the oxygen to be sent home. They then sat us down and told us she had 8 broken ribs. We were so shocked, we were like, how, when, where? All the questions we needed answering, they couldn’t answer us. They said that it looked like it had happened two weeks previously because of the way they were healing and tried to blame us. This meant they did not let her home for a further 6 days so they could investigate. All the time her precious moments were slipping away. Eventually they said it had happened because of the structure of the bones due to Edwards’ Syndrome. They allowed her home and this time sent a list of instructions on how to handle her. When she was in hospital we felt like they were treating us with suspicion and it was horrible, really horrible. I’d never want anyone to ever go through it. From the moment she was born, I had hope every day. Every day from when she was born, I used to kiss her goodnight and say to her every night, ‘keep fighting for mummy, mummy needs you’. At home though, it was horrible, you never knew if you were going to wake up and she’d still be there or when it was going to happen. I lived a life of constantly checking to see if she was breathing. I wouldn’t change it for the world, but it’s a hard journey to go through. Telling people that she was life-limited was incredibly hard. How do you find the right words to say to people? 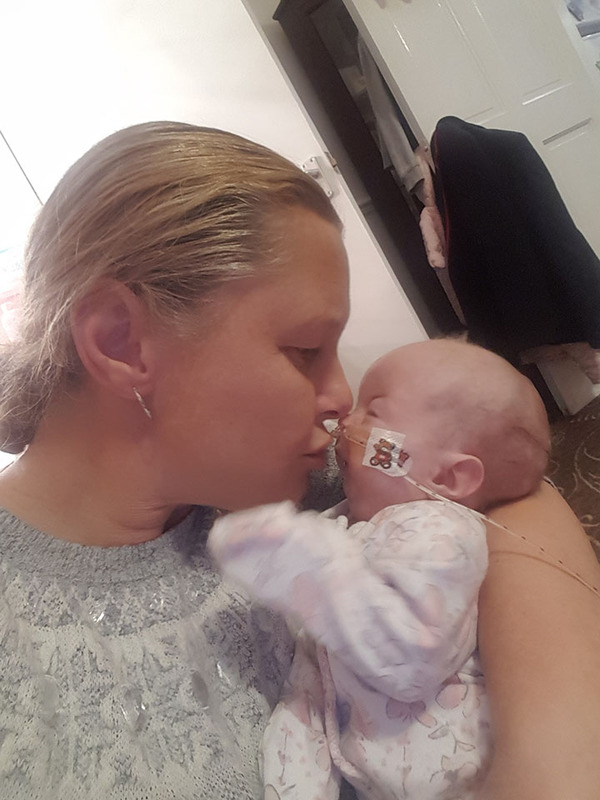 I used to take Katie-Ann to school to pick my daughter up and everyone would be around, ‘ah you’ve had a baby, what did you have?’, and it was heart-breaking because I had to be the one who stood there and said she has got a life-limiting condition, she’s on end of life care. That was the hardest part. I still get it today, people keep saying, ‘how’s Katie?’, not actually realising she’s gone and it pulls, it pulls on your heart strings because it’s heart-breaking but you can’t explain it to people, you can’t. “In the end, her death was really traumatic. She was lying on the floor on Sunday afternoon, 25th November 2018, she watched my son go in and out of the room, waiting for him to come back and she watched him come back. She was lying on her sister, she started crying, she’d done her nappy, I took her off my daughter to change her nappy and then she went blue. She had a lot of blue episodes towards the end, but we were told just to rub her chest, and usually she’d come back. We rubbed her chest, nothing, nothing was happening, nothing was helping, we put the oxygen mask itself on top of her face to push the oxygen through at a higher dose, a higher rate but it wasn’t helping. At that point we phoned the ambulance. When a child has a care plan in place everyone is notified (including the ambulance team) that the person at that address has a particular condition and there is a plan in place. For some reason this was not communicated to them so when they came they had the police with them too, which meant that when she went to hospital there was a policeman actually stood at the end of her bed as she died. When we got to hospital she was still breathing and had a pulse and I asked to change her nappy because it was dirty. They agreed and I started changing it but they kind of tried to rush me and I couldn’t understand why. I sensed something was happening but they did not explain, they told me to hold her, that was it, that’s all they told me to do and then she died. That was the hardest part, I just wanted them to do something, help her, I didn’t believe she’d actually gone. They kept listening for her heart and everything and I kept saying, you can hear it, and they kept saying no, that’s when she finally went. You never expect your children to go before you. I knew it was going to happen but it’s the last thing I actually wanted to happen. I was like living a life in denial, hoping that some miracle was going to happen and she was going to live forever. When she died, we asked for her to be transferred to the hospice to the cold room so we could say goodbye in our own time. When I left her that night, she was still warm, and that was the hardest part in walking away. I just didn’t want to leave her. When I got up the next day it was just like a nightmare, you just lived a long nightmare and she wasn’t there. The hospice were wonderful and she stayed there for a few days during which time we could visit her and hold her. We really feel that the whole situation could have been handled so much better, especially regarding the complete lack of information we were given about her condition, and the way in which she would eventually die. All we were ever told is there was no cure for it and she was eventually going to pass away. We really needed to know what to look out for so we would recognise that her body was starting to shut down but we had none of that, it just happened. Because it was so sudden, I never got that chance to say I love you and I’m going to miss you. Edwards’ Syndrome, also known as Trisomy 18, is a rare but serious genetic condition that causes a wide range of severe medical problems. Sadly, most babies with Edwards' Syndrome will die before or shortly after being born.